ProOmega is great for inflammation. ProOmega by Nordic Naturals is easy to take, & no after taste! 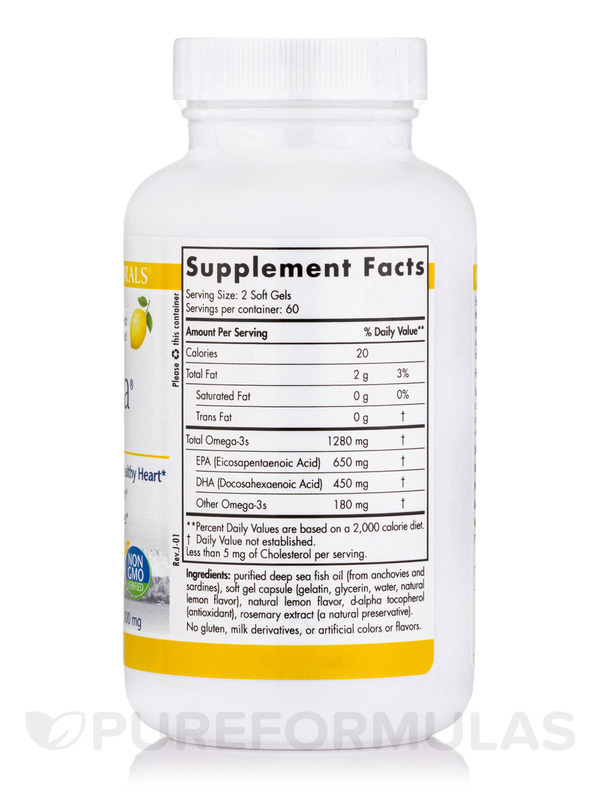 Nordic Naturals has created lemon-flavored ProOmega softgels that deliver large amounts of critically-needed EPA and DHA fatty acids. This pair of fatty acids makes up the key elements of beneficial omega-3 fats‚ which are found in fish oil. Research has shown EPA and DHA to be crucial for the development and growth that takes place in your body: starting from infancy and lasting until the advanced stages of adulthood. ProOmega Lemon 1000 mg a supplement developed with a purification process that yields omega-3 at a purity of 70%‚ a high standard. The process takes place at the molecular level and ensures that every capsule is absolutely free of mercury‚ PCBs‚ and other heavy metals. Users of other omega-3 supplements are familiar with the “fishy” taste that often comes with taking omega-3 products. However‚ Pro-Omega’s soft gels stand apart by having a pleasant lemon flavor that’s the perfect alternative. EPA and DHA supplements may support cardiovascular health. In addition to supporting your heart‚ ProOmega may also work to reduce inflammation that can lead to joint pain and stiffness‚ boost immunity‚ and promote increased brain power and concentration. A balanced ratio between omega-3 and omega-6 fatty acids is recognized as being crucial for maintaining good health. Unfortunately‚ the majority of Americans get far more omega-6 fatty acids through their diets‚ and too little omega-3s; this can result in harmful inflammation. Adding ProOmega to your diet can correct that imbalance and improve overall health. Each bottle of ProOmega Lemon contains 120 soft gel capsules. I like the blend of omegas that this ProOmega 1000 mg, Lemon Flavor by Nordic Naturals provides, the lower dosage, and I the faint "lemon" smell of the gels themselves. I have had no issues of "fish burps" or any other negative digestive issues, so I continue to use. I wish the price was better, but I prefer it to the bargain-priced warehouse store brand. 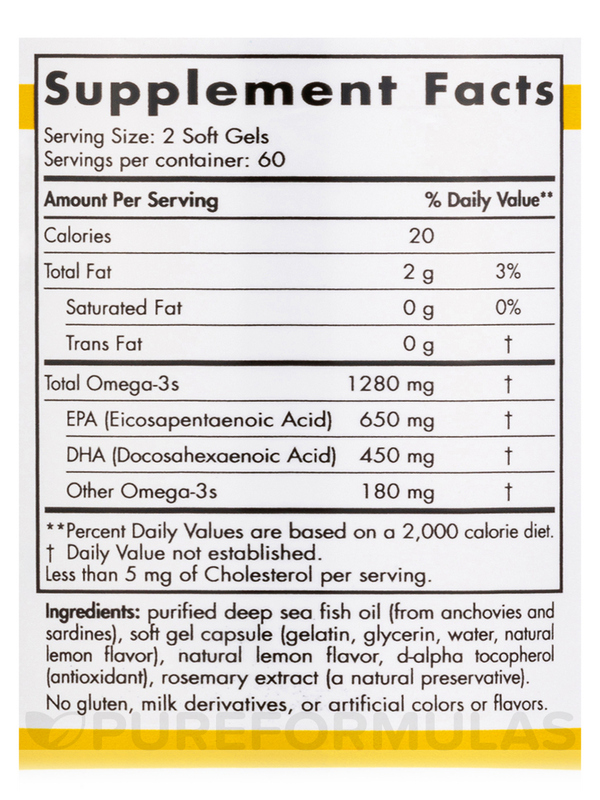 I've been taking ProOmega® 1000 mg, Lemon Flavor by Nordic Naturals for many years as a trusted source for Omega 3. The proportion of EPA and DHA are better in ProOmega than any other brand I have found. That's why it's important to get the PRO instead of just any Omega! 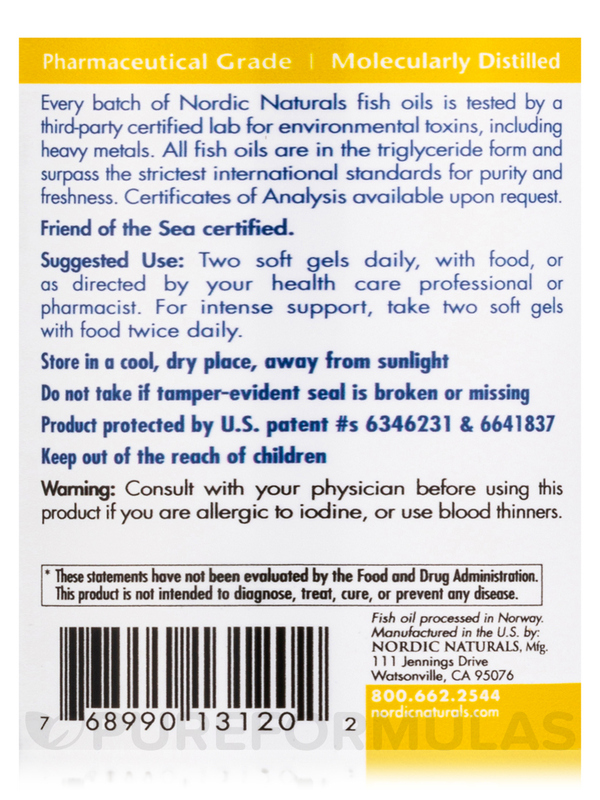 ProOmega 1,000 mg by Nordic Naturals does not smell like fish. Also no burping up fish! No burping up fish like other fish oils. Good price also. 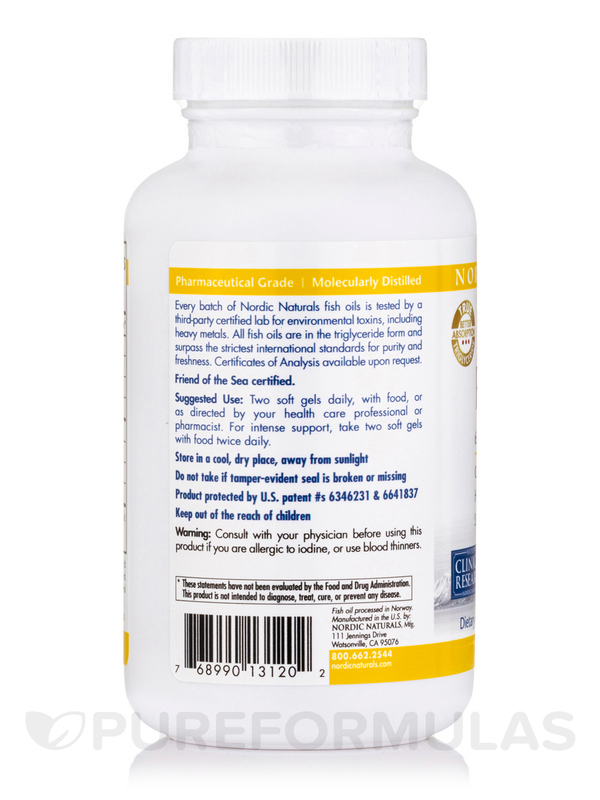 ProOmega 1,000 mg by Nordic Naturals is not only a very high-quality fish oil, but it is the BEST tasting fish oil around. No aftertaste! I like ProOmega 1,000 mg by Nordic Naturals because it has no aftertaste! Easy to take. I have been taking Omega 3 supplements for years, per doctor recommendations. I notice that ProOmega 1,000 mg by Nordic Naturals helps my cognitive abilities and mood, but I know it is recommended for eyesight, immunity, and cardiovascular health. The Nordic Naturals brand is top-notch, from both my experience, and in my opinion. It is cold pressed and the purest on the market. The higher cost compared to lower quality products. ProOmega 1,000 mg by Nordic Naturals works well! Nice light lemon flavor. De backid not know how defficiant I was until my blood work came, ProOmega 1,000 mg by Nordic Naturals help. ProOmega 1000 mg by Nordic Naturals was so easy and convient. I normally get it from my eye doctor for more money and I have to drive to my eye doctor. This came to my home and was less expensive with shipping! Will definitely get this medication here from now on. ProOmega 1000 mg Lemon Flavor by Nordic Naturals is the highest quality fish oil I can find - I even use the dog version for my pets. No after taste. Where do I enter the practitioner"s ID? Hello, thank you for contacting PureFormulas. There is no need to apply an ID to purchase this through our website. 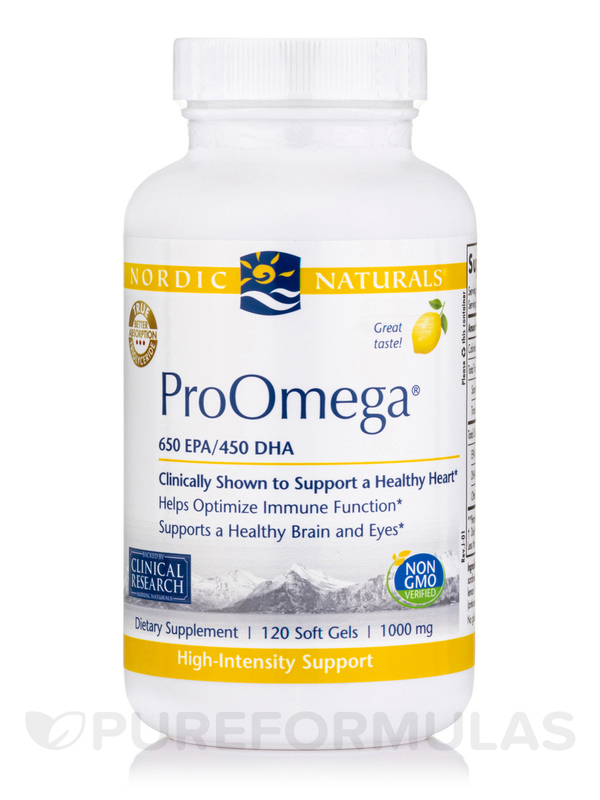 I am looking for coupons for this product ProOmega 650EPA/450DHA Clinically Shown to Support a Healthy Heart Helps Optimize Immune Function Supports a Healthy Brain and Eyes. Need coupons for this type only. Hello Leanna, unfortunately there are no current coupons for this product.